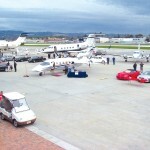 High performance aircraft, automobiles, and people made a spectacular presence at the static display. 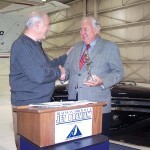 Jerry Lips makes the presentation to Joe Clark, Aviation Partners, for the 2004 Michael A. Chowdry Aviation Entrepreneur of the Year Award, presented by Airport Journals. 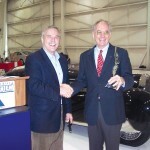 Barry Schiff makes the presentation to Clay Lacy for Airport Journals’ Lifetime Aviation Entrepreneur Award. 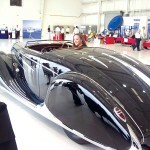 Linsey Lips checks out the million-dollar 1939 Bugatti Type 57C by Vanvooren, originally owned by the Prince of Persia, and now part of the Petersen Automotive Museum. Hal Fishman, longtime Los Angeles KTLA-TV anchor newsman, reads Cliff Robertson’s tribute to Clay Lacy, the recipient of Airport Journals’ Lifetime Aviation Entrepreneur Award. 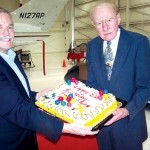 Jerry Lips presents a “Forever Flying” birthday cake to Bob Hoover. Bob Hoover, Robert Pond, Palm Springs Air Museum, and Jerry Lips visit during the Van Nuys Business Aircraft & Jet Preview. 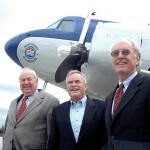 Clay Lacy, Jerry Lips and Joe Clark in front of the DC-3 operated by Clay Lacy Aviation. 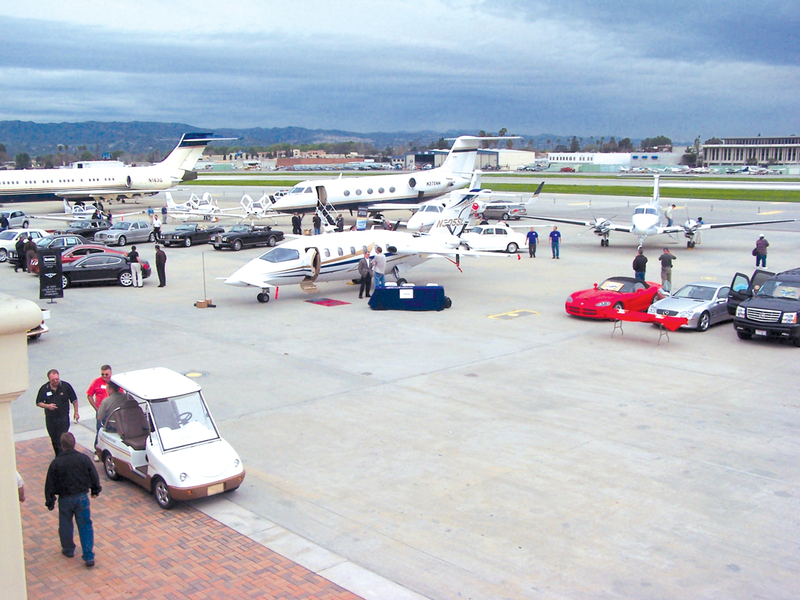 The Michael A. Chowdry Aviation Entrepreneur Award for 2004 was presented to Joe Clark of Aviation Partners, and the Lifetime Aviation Entrepreneur Award was presented to Clay Lacy during our third annual Petersen Aviation Business Aircraft & Jet Preview at Van Nuys. Hal Fishman, KTLA Channel 5 news anchor, the longest running news anchor in the history of television, took Governor Schwarzenegger’s place presenting the award to Clay Lacy. 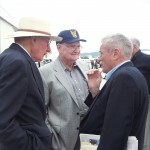 Barry Schiff, the best known aviation writer in America, and Bob Hoover all participated in the award ceremony. 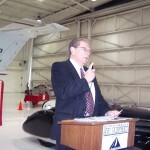 Bob Pond, who owns the Palm Springs Air Museum, was among the more than 700 people that attended the jet show and awards ceremony.